Opportunities unfold: The more a member uses the app, more new ways to earn points unfold. shopkick is a coalition loyalty program whose partners comprise both merchants/restaurants (eg, Macy's, Best Buy, American Eagle, Red Robin) and brand products (eg, Procter & Gamble, Unilever, Disney). Using their smartphones, members earn kicks (shopkick's term for points) that are redeemable for rewards at its Rewards Mall, accessed on the app. Rewards range from gift cards and iTunes song downloads to movie tickets and handbags. The company links mobile technology with physical retail (brick-and-mortar) to make shopping an interactive experience. It has added a new spin to reward programs because members may earn kicks without spending money. It is the ultimate "get something for nothing" pitch to consumers. The goal is to encourage members to visit partner stores and interact with products, turning browsing into buying by motivating members to make in-store purchases. shopkick has positioned itself as a shopping-based app that integrates social features, as opposed to a socially-based app that integrates shopping features (eg, FourSquare, Facebook's "Deals"). This reverse distinction sets shopkick apart and is one reason to which it attributes its growth and success. Why become a shopkick member? What are the rewards of membership? kicks earned are redeemable for rewards at the shopkick Rewards Mall accessed on the app. The Mall offers a vast array of rewards including brand-name products, gift cards, Facebook credits, or the opportunity to donate kicks to charitable causes. The largest reward I noted is a Vespa scooter available for 1,875,000 kicks. Based on my findings, most rewards give a kick the value of 0.4c. For example, you can currently redeem 500 kicks for a $2.00 gift card at either Target or Best Buy; or you can redeem 6,250 kicks for a $25 gift card at the Ritz Carlton. One exceptional value is redeeming 875 points for a $25 voucher from Restaurants.com (where the value per kick is 2.9c). First download the free shopkick app (available for both iOS and Android platforms) from websites including www.shopkick.com and iTunes. Members open the app and tap "Find kicks nearby" to locate participating area merchants (clustered into groups by proximity). Members tap a merchant's listing to see if it is offering opportunities to earn kicks. As an additional benefit to members, partner merchants may feature "offers" (special price promotions) on in-store products. Furthermore, as members engage in the program, they may be offered additional ways to earn "bonuses" that can include kicks, bonus pieces, badges and build-ups (extra kicks for your next walk-in). How does shopkick know if a member is in a partner store? shopkick requires that partner merchants install a brick-size 'shopkick signal' transmitter next to the store's entrance. When the shopkick app is open, the smartphone's microphone picks up the transmitter's inaudible signal. shopkick is a coalition of retailers, restaurants, brand products and financial partners. It is currently present in approximately 7,500 retail outlets across the US. The five initial partners: Macy's, Best Buy, Sports Authority, American Eagle Outfitters and the major mall operator, Simon Property Group have now been joined by other well-known names such as Target, Crate & Barrel, Old Navy, Wet Seal, and ExxonMobil. shopkick also heavily emphasizes its brand partners including such well-recognized leaders as Procter & Gamble, Unilever, Colgate, Mondelez (Cadbury, Kraft, Nabisco, etc), Levi's, and Disney. 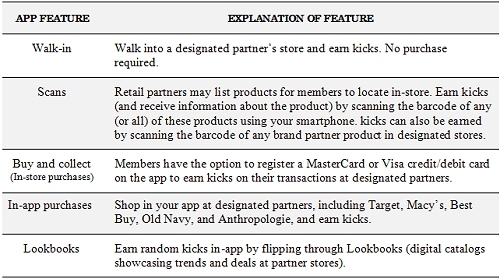 The program enables members to interact with these brand products through "scans" (ie, scanning the product's barcode in-store) to learn about the products and thereby be rewarded with kicks. No cards required. Members need only a smartphone to participate. Rewards. Members can earn kicks for rewards they would not normally receive at a variety of well-known retailers. Flexibility. Members are able to quickly earn and accrue kicks in a number of ways from a wide range of partners. Gamification. The program utilizes game mechanics (in a non-game context) to make participating in a rewards program more engaging and entertaining. Decrease showrooming. This is the growing consumer trend of using brick-and-mortar stores to view products and then purchase them from online-only competitors. shopkick motivates members to visit physical retail stores, interact with products, and make in-store purchases to earn kicks, its reward currency. For all partners, this leads to increased sales. Reach desirable demographics. shopkick's predominant member demographic is one of the most sought-after by retailers: 20 to 30-something year old females, about half of whom are parents. Growth potential. shopkick is centered on a growth market as the number of smartphone users is steadily escalating. eMarketer (April 2012) reports that in 2013, the majority of US mobile phone users will have a smartphone; in 2015, the majority of Americans (54.2% of population) will have a smartphone. In sum, what is there to like about shopkick? Attainable Rewards. The shopkick Rewards Mall offers a large selection of appealing, attainable rewards. Membership is noncommittal. The program is free, does not require members to sign up for promotional emails, nor purchase anything to earn points for rewards. Rewards for visiting stores and interacting with products. A member can earn kicks just by doing, eg, entering a store or scanning item barcodes. Rewarding such simple acts may seem wasteful but, in reality, are ways that, when repeated over time, increase knowledge of, familiarity with, and favorability towards, the store or product. Large network of partners. Members are able to earn kicks quickly at a vast array of partners in different sectors (retail, restaurants, brands). Quiet modern-day coalition. shopkick has quietly tied together many well-known retailers and brands into the first rewards-earning, card-less, nationwide coalition using mobile technology.